49 Lukie Points will be rewarded to you when you buy this. Pokemon Fire Red GBA Game Boy Advance Game Cartridge Cleaned Tested and Guaranteed to Work! My copy of fire red came looking perfect. No significant cosmetic damage to the label on the game, still had that shininess to it. Lukiegames does it again! I recommend this website to anyone that compliments me on my gameboy/games without fail. Great game. Cartridge is in perfect condition. Fast shipping took less then expected. Thanks Lukie for the best buying experience! So glad I was able to get this game again and relive some childhood memories. Shipping was quick and the cartridge runs great. Shipped quick and I got the game on time. No issues at all. Game runs great. Just like it was new. Love my new game. Great game! I play it everyday! There are No issues with the game and I was able to track the shipment online until it finally arrived . Lukie games is quick and easy and once you start playing this game, you won't be able to put it down. Go Pokemon! Go lukie games! I got this to start my pokemon game collection from early 2000's. My favorite pokemon game! Great game. Fast shipping (received the game along with my other items within 3 days). No physical flaws or software flaws. I do prefer better packaging though. Please wrap the games individually for better protection instead of just chucking the physical game into the box without wrapping it. 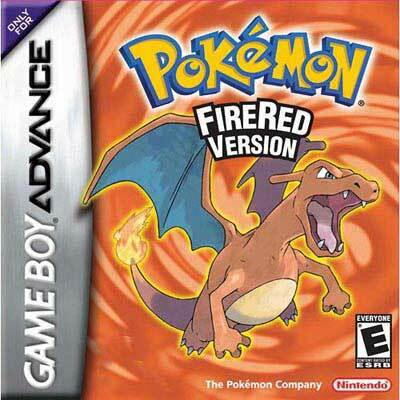 Hi i'm Patrick Moffatt and i am Reviewing Pokemon Fire Red for the Gameboy Advance and i am so excited to play this Game and i was very good at this game i got a lot of Pokemon i got Articuno Zapdos Igglybuff Squirtle and finally Unknown and i got a lot of Pokemon and i can play on my Gameboy Advance SP to play this game and i was very good at this Game and i was good at it and i was got a lot of Pokemon so i cann play on my Gameboy Advance SP to play it and i am Reviewing Pokemon Fire Red for the Gameboy Advance Thank you. Came in the mail like new condition super fast along with the gba sp ahs 101. This game is the real deal no fake copy like ebay. this is 100% authentic watch out for fakes on ebay. This game is a remake of the original pokemon red for gameboy with a few tweaks. I have to say, i use to play the original pokemon red hours & hours I completed it at least 7 times. Now I get to relive those good old days with pokemon fire red in living color with a a few tweaks & I have to say in my opinion it's better. Only thing it lacks is the original sounds from the original. I mean it has the same songs they just sound a little different. but that's minor still this game rocks by far the best pokemon game 10/10. Thank you luckiegames for this game im speechless. I was honestly VERY impressed. I was really skeptical at first because of the low prices, but it arived fast, and when i got it, it was in amazing condition i couldn't be happier, i'll definitely be back! Works perfectly and still as fun as it was when I was a kid!!! Got this for my 9y/o grandson. Arrived on time and in good condition. He enjoys playing it on his DS. He likes this game over leaf green. Works really well. Will use this site again. As for the original series, ( the red and blue), no one can beat. This is a great port to the gab with added features. Thank you Lukie games for your awesome store of goodies! The game works like a dream. It's completely authentic and was certainly a great buy. Highly recommended for anyone who enjoys their pokemon!